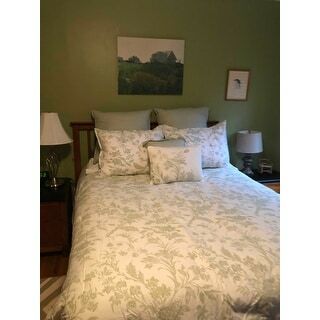 Jade green is a serenely beautiful color and it brings a lovely tranquility to this Laura Ashley Natalie comforter bonus set with classic floral toile on a cream cotton ground. Coordinated with a crisp shirting stripe on the comforter reverse and European shams, this timeless classic fits easily into a modern bedroom. A floral embroidered accent pillow repeats the comforter design and lends a unique, customized detail to the ensemble. 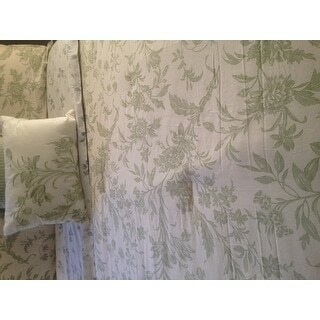 I love this comforter set...beautiful greens on a white background. The coordinating pillows and shams are perfect. I was so enamored with this set that I repainted my wood moldings and doors from cream colored to white. 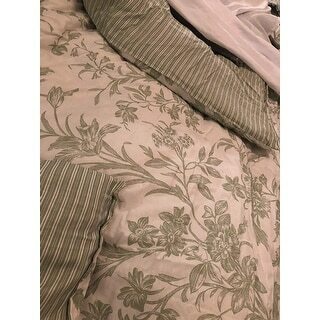 I also liked the green and white ticking on the reverse side of the comforter and can see me using that side as well. This is so soft, light and billowy. Perfect summer weight comforter for just enough warmth on chilly nights. The white is a true white, the green is a soft and subtle grass-green and sage combination. Print is pretty, not too busy. I love this set. I am staging our home to sell it and am choosing the most beautiful things at the best prices. Laura Ashley does not disappoint. It's a classic and it is lovely. Others have mentioned that the quality of the pillow shams is not good. I agree that they are not heavy but the quality is good. Well sewn. It should be noted that two of the shams are Euro shams and so will require specially sized pillows to fit well. That may be where some of the others confusion comes into play. It's a lovely set. I would and have recommended Laura Ashley to others. 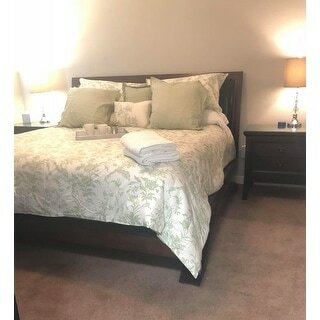 Very nice Comforter Set (Laura Ashley Natalie Green Floral), I was really impressed with the quality of the product. I would recommend this set to my friends and family. This comforter set is amazing. I remember when I was growing up, Laura Ashley was a very popular store, and I wondered where it went all these years. Finding Laura Ashley comforter sets at overstock.com has been a great find, because they are very fashionable, classy, they go with a lot of decor, and they truly bring out the girly feeling in everyone. For example, I bought this in order to be part of my guest room, however, I think that I might want it for my own room as well. I find that with these types of comforters, they can be interchange, as well as, with the pillows included, find themselves wonderful for any room, for any person to sleep in the bed. Furthermore, this comforter is incredibly comfortable, soft, as well as, not too hot. This is a lovely bedding set, added bonus of 2 throw pillows, rectangle shaped sham, and a square pillow case. All fabrics coordinate with each other, very pretty. Love it all! 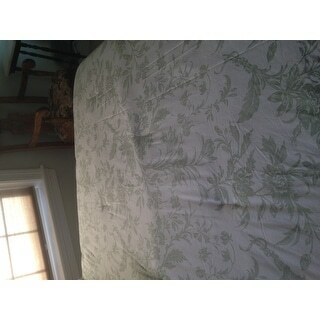 Love this Laura Ashley comforter set - it has a nice weight and is soft and comfortable. 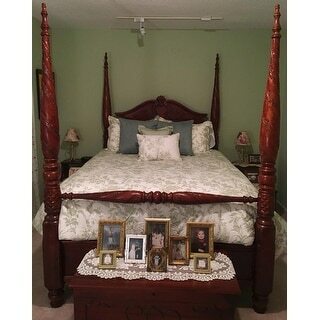 It fits my king sized bed generously as you will see from the photos. I love the reversible stripes and the sage green toile - they compliment my dark wood furniture nicely. I would highly recommend it if you are thinking about a purchase. Very happy. I love the colors of this bed set. Someone else had mentioned about the thin pillow shams. I added white coverlet pillow shams and did away with the printed ones that come with it. It actually looks better. For the price, you can't beat this look. This comforter set is beautiful. The green color is really nice without being too bright. A true green without a yellow tint, which is exactly what I was looking for. The comforter is a nice weight and reversible so you can change the look of your room If you would like. The pillows are beautiful and an added bonus. The new bedding looks absolutely beautiful in the room. It has inspired me to purchase a new French Provencal bedroom set coming soon. I love the soft look of these comforters - Country French design. Elegant and very well made. Good buy! Beautiful comforter set. 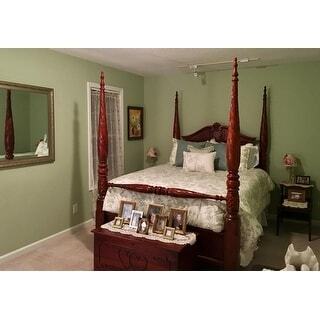 A real value and the colors worked perfectly in a newly decorated bedroom. The Euro shams really set this bed off and makes me want to take a nap! Highly recommend!! As described. Pillows were well made. Bought the set for a family member and they love the quality! I have always been a big fan of Laura Ashley products and was pleasantly surprised that Overstock sold the brand. The quality is great but the set looks beautiful too! Comforter is beautiful, but undersized in all directions, and reluctant to release a wrinkle once one forms. The packing said queen but I would swear it was full. Order accordingly. Lovely comforter. Very soft green that pairs well with touches of pink. I love the softness of the set, but I do have one issue. The color of the comforter and the pillow case is slightly off. Idk if received a returned item or it is just a manufacturing discoloration so just know that items may differ. It's very nice looking, but (and this is my fault for not noticing before I bought it, i would have much preferred to have a bedskirt rather than two sets of shams - one of which I will never use. Such a great value for this Laura Ashley set. The perfect compliment to our guest room. Wonderful springtime addition to the room. Beautiful and cheerful. Very pretty, look just like the photographs. Seems very comfortable. Wish there was a way to get matching sheets, etc. But I am very happy with my purchase. Very pretty, dissapointed that there was no bedskirt included with the set. Instead I ordered a different skirt to match. Soft colors in the green has a relaxing feel. It is rather bland, but very much like the picture. It is just that the room really needs a little more "punch." "With the king set how many sham covers and European covers, come with the set"
"Is Queen size available now?" Yes, this is currently available in the queen size. "What does 5 pieces 7 pieces mean? And how do I pick which one I want?" 5 pieces come with the twin set, 7 pieces with the other sets. Twin set only has one of each sham. "What comes in the set?" Comforter, 2 large square pillow cases, 2 pillow cases, 2 decorative pillows. "Does this come in a Queen size"
"Does this set come in Queen?" "What is the measurements? will it fit on the table bed?" Will it fit in a twin xtra long bed?